Suction Cup Mounts are pre-engineered adapters for attaching a suction cup to your robot wrist fast and easy. 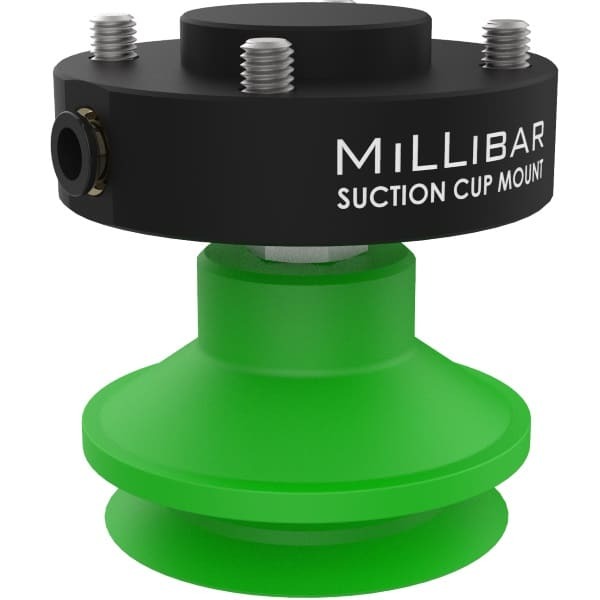 Each suction cup mount bolts directly to the mounting flange on the robot wrist and supports various thread sizes for the suction cup port. Integral push to connect fittings are low profile and speed installation. These mounts attach to all sizes and series of Universal Robots and robots with a 50mm bolt circle based on the ISO 9409-1-50-4-M6 standard. Use the table and drawing below to select the dimensions for your application. Select one of the options below to download a 3D .step file of the extension.